Republican Speaker of the NC House Thom Tillis sez there's a "philosophical divide" separating his House budget from the NC Senate budget. Is there a difference between hatred and contempt? Is there a difference between blight and contamination? Is there a difference between decomposition and putrefaction? 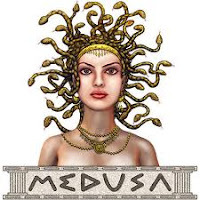 Which snake on Medusa's crown do you prefer to be bitten by? If you can find a difference worth writing home about between two horrible, backward, cruel North Carolina budgets, one written in the Senate and the other in the House, then you're welcome to your hair-splitting. The only actual difference we see is that Thom Tillis is running for the U.S. Senate and therefore needs to appear more moderate than the far-right let-them-eat-wallpaper-paste NC Senate. But Tillis is as big a jerk and vandal to the public good as any of the senators. He's just slicker.